Coconut oil is rich in vitamins, minerals and carbohydrates which are great for your health and beauty as well, when speaking of beauty, coconut oil can do miracles for your hair and skin, in this article we will speak of its benefits to the hair particularly and how to use it to get all its potential benefits. Coconut oil will be just as effective as the other expensive cosmetic products but without the side effects, check out below how to use coconut oil for your hair. 1- Leave-in Hair Conditioning Treatment. Coconut oil is rich in lauric acid as well as medium-chain fatty acids so it will penetrate your hair strands easily and provide its needs of moisture and nutrients. Just warm some coconut oil and apply one tablespoon to your hair and scalp, cover with a shower cap to protect your pillowcases and then with a towel, sleep like that overnight and in the morning shampoo your hair, repeat this remedy once a week or more if possible. The lauric acid found in coconut oil helps in stimulating blood circulation which in return helps your hair to get nourished properly and at the same time stimulate the growth of new hair follicles, just massage one teaspoon of coconut oil to your scalp for five to ten minutes then cover with a shower cap to keep the heat in , you can shampoo your hair after that it leave the oil in. 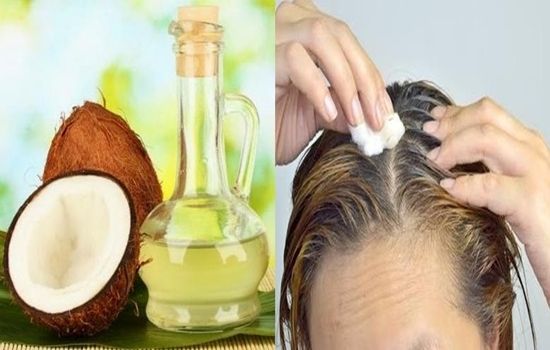 Coconut oil has also antifungal properties which makes it a brilliant treatment for Dandruff, it also contain cleansing properties that will prevent the first and dust accumulation in your hair and scalp while nourishing your hair with vitamin E and K. Use the same above scalp treatment for at least two weeks to start seeing a result. Coconut oil can work as a natural sunscreen to protect your hair from the damage of the sun while you are out enjoying your time on the beach, it also helps in preventing your hair from drying up from the sun’s heat as well as keeping your hair in shape. When you jump in the water, the coconut oil will give you the ideal beach waves with no effort.